Ocean Sand, Bahamas | Flickr - Photo Sharing! Though the above image may resemble a new age painting straight out of an art gallery in Venice Beach, California, it is in fact a satellite image of the sands and seaweed in the Bahamas. The image was taken by the Enhanced Thematic Mapper plus (ETM+) instrument aboard the Landsat 7 satellite. 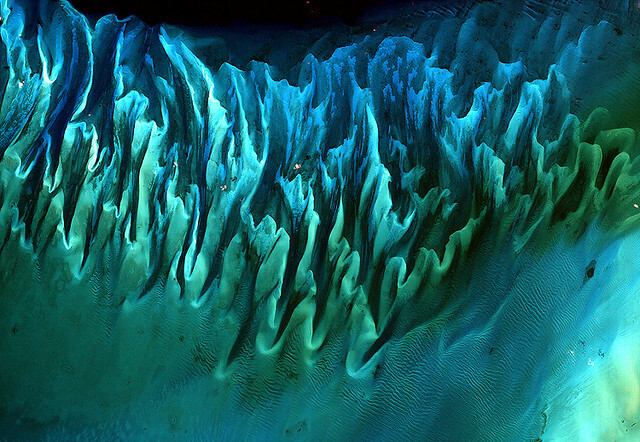 Tides and ocean currents in the Bahamas sculpted the sand and seaweed beds into these multicolored, fluted patterns in much the same way that winds sculpted the vast sand dunes in the Sahara Desert. Fotosconlosojos, thx for being here, and 157 other people added this photo to their favorites. well done serge and thank you for sharing! The "Art" of science ! ! ! ... VERY interesting ! ! !